What’s Afterpay and how does it work? Many Australian companies have embraced Afterpay, but if you’re not sure what it’s all about – we can help. Afterpay is a new way to pay for purchases online (including on the Healthy Mummy site). It allows you to shop, place an order, and pay for it later in four installments. You pay nothing extra if you pay on time, so there’s no risk. It’s a bit like layby, but you get to have the items now and pay them off later with your credit or debit card. First time users just need to fill in their details, and there is no approval time so you can just click and go. As well as Healthy Mummy products, you can also use Afterpay to make purchases from other online retailers. Think clothes, tickets, travel, and more. 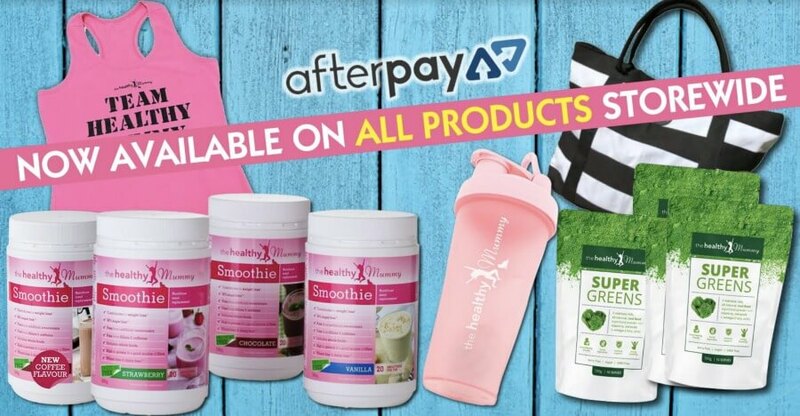 All of the Healthy Mummy products are available on Afterpay with the exception of our subscription products. This Australian company launched in 2015, and claims to have the ‘highest level of security in the payment industry’. Many well known retailers use Afterpay, including Top Shop, General Pants, Tony Bianco and Cue.